NEW YORK (Sporting Alert) — Watch the 2014 Super Bowl Live on Fox, on your computer or tablet at FoxSports.com or on your Mobile Device. 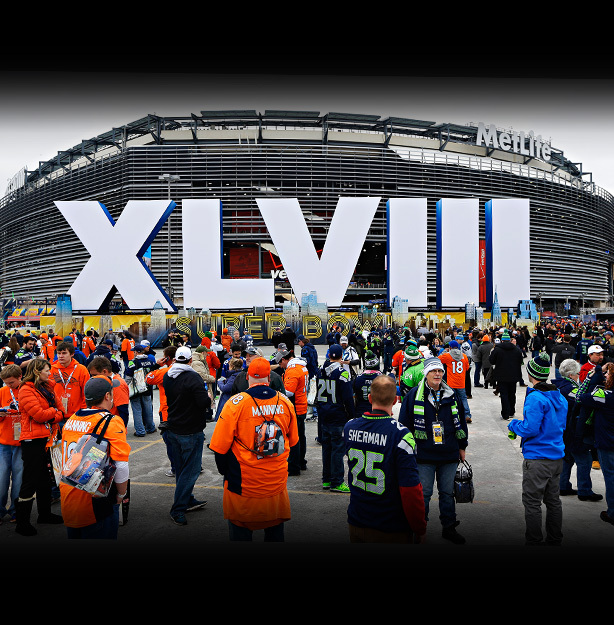 The wait is almost over for football fans as this Sunday Super Bowl XLVIII will decide the best team in football for 2013. Watch: What will Peyton Manning’s legacy be? Peyton Manning and the Denver Broncos will take on Russell Wilson’s Seattle Seahawks in what is bound to be a thrilling matchup. It pits the number one offense in the league against the top defense for the championship. Manning will try to cap off his historic season with his second Super Bowl win. This one has a bit of a twist as he will be playing in the home stadium of his brother Eli’s, team the New York Giants. There has been a lot of talk about Manning not being able to play in the cold this year. While the weather forecast does not call for frigid temperatures on Sunday it will not be warm so this will be a factor to keep an eye on throughout the game. The Seahawks come into the game with a lot of swagger but the Broncos offense is a challenge unlike any that they have faced this season. Soon enough Richard Sherman and company will get the chance to prove whether or not they can lock down all of the Broncos weapons. Demaryius Thomas, Wes Welker, Eric Decker and Julius Thomas are enough to give any defense fits so the Seahawks will need to get some pressure on Manning to help out the secondary. The key to beating Peyton Manning has always been to put him on his back. Not many teams have been able to do that this year but Michael Bennett and Cliff Avril have been an effective tandem this year harassing quarterbacks to the tune of 16.5 sacks and 6 forced fumbles. The Seahawks will likely look to limit the Broncos opportunities by running the ball with Marshawn Lynch. Between their league best defense, a strong running attack and Russell Wilson’s playmaking abilities the Seahawks will be an incredibly difficult matchup. While the Broncos are not going to be intimidated by anyone, they were victimized by a strategy of running the ball and the clock against the Chargers earlier in the season. If the Seahawks are able to execute this same strategy they could emerge from Super Bowl XLVIII as the NFL champions. Without a doubt this game should be a close contest. Manning will look to permanently quiet his doubters while Russell Wilson looks to add to his own budding legacy. The Seahawks and Broncos will settle the debate between defense and offense for this season at least.